Pop the couscous into a small bowl, just cover with boiling water, then put a plate on top and leave for 10 minutes. Peel and finely chop the onions and garlic along with the sultanas and place in a large pan on a medium heat with a lug of oil, the turmeric and cumin seeds. Fry for around 15 minutes, or until softened, stirring occasionally. Finely shred the lamb, add to the pan and cook for a further 5 minutes, then remove the pan from the heat. Fluff up the couscous and stir it through the lamb mixture with the crumbled feta, then season to perfection, going heavy on the black pepper. Preheat the oven to 180°C/350°F/gas 4. Working fairly quickly, as filo dries out easily, lay out the pastry sheets on a clean work surface and brush with oil. Divide the lamb mixture between them, laying it along the shortest edge of each sheet. Roll each one up halfway, fold in the sides, then continue rolling up like big cigars. Place them on a non-stick baking tray, brush the tops with a little oil and crumble over the almonds, or sprinkle with the sesame seeds. Sieve over the icing sugar and cinnamon from a height, then bake for around 25 minutes, or until golden and crisp. Serve with yoghurt, rippled with harissa or chilli oil, for dipping. Delicious with a simple green salad on the side. 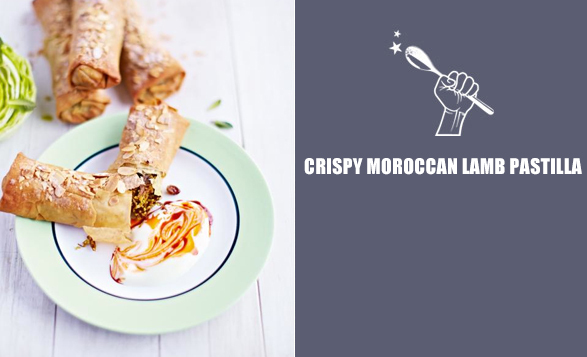 Feel free to mix any leftover meat with these beautiful Moroccan flavours – whatever you’ve got will be delicious.